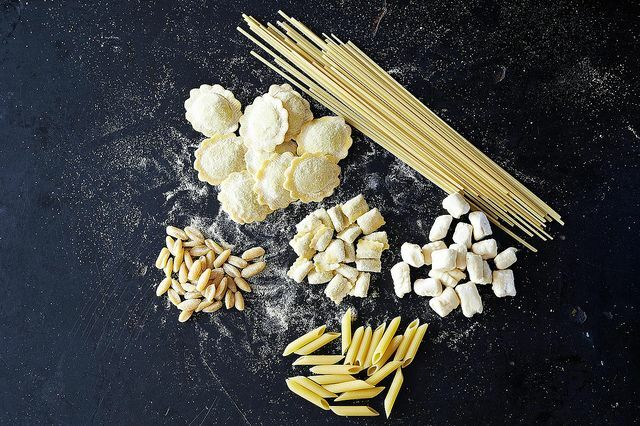 Today: The first step towards perfect pasta? It's all in the salt. If you're reading this post, most likely you know how to cook pasta. In fact, you probably know three entirely different ways to cook it. Heck, you probably know how to whip up some ravioli -- from scratch. But even the most seasoned of cooks can make the cardinal mistake of under-seasoning their pasta water. We're here to ensure that there's enough salt in every pot. While you can certainly throw in a a few sizeable pinches of salt and leave it at that, let's dig a little deeper. Do you really, really have to salt your pasta water? Why? When is the right time to add the salt? And what is the optimal salt-to-water ratio? The short answer is yes. You must salt your pasta water. Even when tossed with a flavorful bolognese or a pesto, if you haven't salted your pasta water the entire dish will taste under-seasoned. Seasoning the pasta water is the only chance you have to flavor the pasta itself, and it's a necessary step that shouldn't be neglected. "For every pound of pasta, put in no less than 1 1/2 tablespoons of salt, more if the sauce is very mild and undersalted. Add the salt when the water comes to a boil. Wait until the water returns to a full, rolling boil before putting in the pasta." As one of the foremost authorities on Italian cuisine, and the woman behind this legendary tomato sauce, I tend to take Marcella Hazan at her word. But after a bit of poking around, it seems that when it comes to salting pasta water, there's no hard-and-fast answer. More: Learn how to make fresh pasta from scratch. Many (including Marcella herself) claim that the salt must be added to the water only after it's at a full boil. Others add salt to their cold water from the get-go, so they don't have to worry about it later. If you opt to add your salt to cold water, make sure to swish it around with a spoon (or your hand) until the salt dissolves. Salt is corrosive, and could pit your pot if not dissolved before your pot hits the heat. More: Now that you've got a perfect pot of pasta, here's how to sauce it. Chances are, when it comes to pasta water, you've heard the age-old adage "It should taste like the sea." I personally like to imagine it declared, not spoken, by a wizened Italian matriarch while she gesticulates wildly, flinging salt haphazardly around her rustic kitchen. 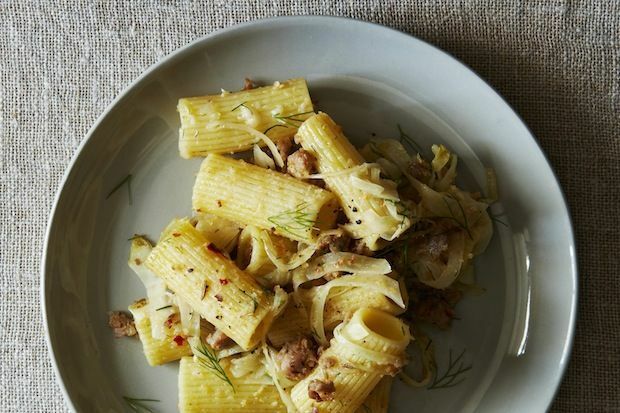 When it comes to cooking pasta, this fuzzy measure seems to be most chef's rule of thumb. So what does that translate to in cold, hard numbers? After scouring the internet, results vary from 1 1/2 tablespoons to 3 tablespoons of salt per pound of pasta, with most people falling in around the 2 tablespoons mark. If you gain satisfaction from neat measurements, feel free to get out your measuring spoons. However, I find that a few very hefty pinches will suffice. While the amount of salt in your pasta water will affect the end result, so will the type of salt. Stephanie Stiavetti of The Culinary Life blog begs you never to use iodizied salt, which she claims will give your pasta a metallic flavor. Christopher Boswell, of the Rome Sustainable Food Project, never uses anything other than coarse sea salt,: the choice of Italians. However, fine sea salt, or ever kosher salt, will do the trick just fine. This has been a Public Service Announcement from your friends at Food52. Remember folks: Salt your water with verve. Salt your water with panache. But, above all, salt your water -- period. How do you salt your pasta water? Let us know in the comments! Since salt will lower the boiling point of water, adding when the water is at a full boil could cause a quick transformation to steam and create a mess at a minimum, or hot water on to you which could hurt. Add it to cold water. Not true - though it would actually be nice if adding salt could help your water boil more quickly, it's the opposite - adding a solute like salt or sugar to a solvent (here, water) results in boiling point elevation, not depression. Adding salt when your water is already boiling could, however, put you in danger of getting burned if you aren't careful and let your hand or metal spoon contact the steam...but I've never had this issue. 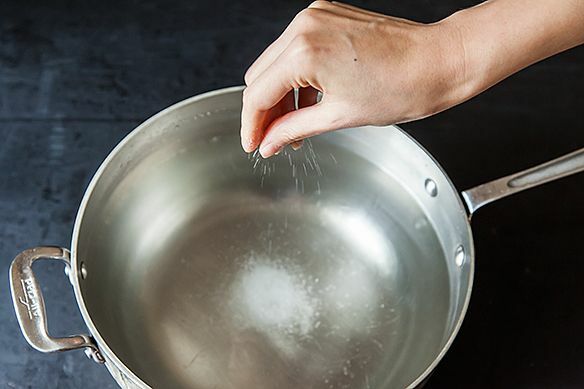 I like to wait for the reasons outlined in this article (avoiding pitting the pot), and salt will dissolve more easily in hot water, giving you a nice even distribution. Neither way is wrong, just works better for me and I've never had a problem. I don't usually wait until I'm at a full boil, however, as I like it to have time to dissolve fully before I add my pasta, and I have no patience - as soon as we've got a boil, the pasta goes in! The comment that Margaret Magennis Quinn left, was NOT in response to MY comment, but to the first picture, which is indeed a pot that definitely could stand some cleaning. As soon as I saw that dirty old pot, you lost me. Clean your post, inside and OUT. Lazy, lazy lazy. I don't add any salt to my pasta, and no one has complained that it doesn't have any salt. I also don't add salt to the sauce for the pasta, this isn't because I have a medical condition, I just feel that the person eating the dish, should have the option to either salt or no salt, my husband salts his, my granddaughter and I don't. This strange article keeps trying to equate the amount of salt to use to the amount of pasta (like, two tablespoons per pound of pasta). The amount of pasta is meaningless, what matters is the amount of WATER you boil. If you tend to use a huge pot full of water, the salt will be FAR more diluted and you will need to add more to get it salty enough to "taste like the sea". 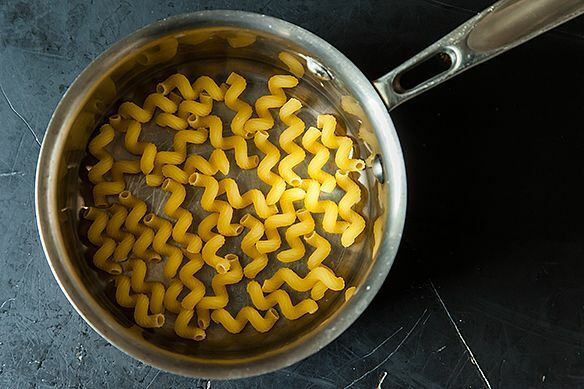 The amount of pasta you put IN the water doesn't matter. This is obvious, why doesn't the article address this? I agree completely!!! In fact, I watch a lot of cooking shows and collect recipes on-line as well, but I cut the salt back by 1/2 to 2/3. I want my food seasoned and taste delicious, but I certainly do not want my blood pressure to be 200/120. You cut back from 1/2 to 2/3? I think you mean you cut back from 1/2 to 1/3. You're right and the article should address this - but I think the author (probably incorrectly) assumes that readers more or less will be using the same amount of water per pound, following classic Italian cooking guidelines (about 4 quarts/16 cups per pound is what I generally see as the standard). I agree--put the salt in after water boils. Use a good coarse Kosher salt. Not only will it save the pan over time, it will taste fresher. I do the same with a cheese wedge of Parmesan to many things. ....and also don't forget to put a little oil in the water. The pasta texture will be better. I have to eat a low sodium diet, so I never salt my water these days. but Iwill try it next time I cook pasta. I always see star chefs on TV saying they are putting in a few teaspoons of salt to a dish, but they are clearly putting in more. Wow, I definitely need to add more! Here's what I always tell people (actually, I was training a new guy the other night on the pasta station); salt your water and TASTE it. Dip your finger in, taste..if you don't cringe, it's not salted enough. I do a "3 count" when pouring in the salt for service every night. Granted, it's about a 30 qt pot. And also, it's kosher salt, so the "salinity" will be less intense with more salt. Personally I like to use pugils (soft G as in pugilist), the amount of a substance that you can pick up with your thumb and first two fingers. I like the anachronistic. Wish there was a blind taste test on this. Despite being an aggressive salter, I find the pasta never picks up enough. I have a similar problem with roasted vegetables, though I'm sure the reasoning differs. I was surprised to find out how much salt Italian cooking experts actually use. While I was working in a kitchen, the cooks would put a whole handful of salt in their water (granted, it was a much larger pot). I think it just goes to show the pasta absorbs so little of the salt that if you want it to be seasoned, you've got to be a bit more aggressive that you think. I don't like overly salty pasta so I rarely add salt to the water. I think it is a personal taste issue so there's no exact rule! Marcella Hazan with all her tomato onion and butter magic,was no scientist. You started the article by mentioning the "proper way" to salt your pasta. I find it misleading to reference anecdotal info as the results of your findings. Taste tests have proven that salting/seasoning your sauce properly is way more important than salting the pasta. ***This only holds true if you add your non-salted cooked pasta to a hot pan sauce to finish off the cooking process. The salt sticking to the pasta is nonsense. That salt is disintegrated moments after hitting a boiling liquid/sauce. I very rarely add salt to my boiling water and just add a little more salt to the sauce than usual,to compensate for the addition of pasta at the end. Actually, the salt does not 'stick' to the pasta, it is absorbed by the pasta (think of the salted water as pedialyte for noodles). For empirical evidence of this fact, one only needs to take a good quality dried pasta and cook two batches, one with salt and one without. The one with salt will be delicious simply drizzled with good olive oil. The one without will be boring. As for salting the sauce instead, consider that the flavor of good (fresh or dry) pasta deserves to shine just as much as the sauce. Salt enhances flavor, and any pasta worth eating should benefit from this enhancement so that instead of being smothered, it can marry the sauce. I've always heard that salt increases the boiling point of water, thus cooking the pasta at a higher (better?) temperature. There are also some that argue that adding salt to the water will make it come to a boil faster. AntoniaJames is absoultly correct, salt does raise the temperature of the pasta water. in addition, I was always told that the culinary logic behind adding salt (beside flavoring the pasta), was to prevent the drop of the temperature of the pasta water, when you add pasta to it; the higher boiling point of the pasta water, helps to counter this the temperature drop, hence saves time & energy. As to all the salt-affects-the-water theories (outside of the salt-seasons-the-pasta claims): in my tests, the water doesn't get hot faster, stay hot longer, etc. with salt. 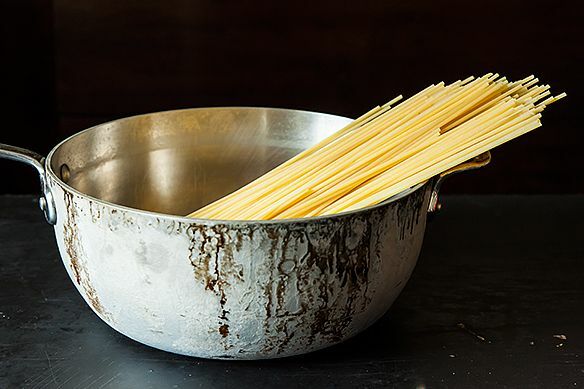 BUT: you must of course start with a tremendous amount of water in your super-large pasta-cooking-pot, get it furiously hot before adding pasta, and keep it roiling during the pasta-cooking! I discovered some years ago that if you lightly salt the cooked pasta in the colander, it's a much more effective seasoning...and you can taste if the ratio is right. Do you salt your pasta water as well? I do not! The salting in the colander is sufficient! I too always toss the cooked pasta in a pan with the sauce. And I can tell you that with my method the pasta definitely tastes seasoned with salt!